Hello, dear readers! Welcome to another post from my blog. On this post, we will talk about the virtualization technology called Docker, which gained a ton of popularity this days, specially when we talk about Microservices architectures. But after all, what it is virtualization? Virtualization, as the name implies, consists in the use of software to emulate any part of a environment, ranging from hardware components to a entire OS. In this world, there is several traditional technologies such as VMWare, Virtualbox, etc. This technologies, however, use hypervisors, which creates a intermediate layer responsible for isolating the virtual machine from the physical machine. On containers, however, we don’t have this hypervisor layer. Instead, containers run directly on top of the kernel itself of the host machine they are running. This leads to a much more lightweight virtualization, allowing us to run a lot more VMs on a single host then we could do with a hypervisor. Of course that using virtualization with hypervisors over containers has his benefits too, such as more flexibility – since you can’t for example run a windows container from a linux machine – and security, since this shared kernel approach leads to a scenario where if a attacker invades the kernel, he automatically get access to all the containers provided by that kernel, although we can say the same if the attacker invades the hypervisor of a machine running some VMs. This is a very heated debate, which we can find a lot of discussion by the Internet. The fact is that containers are here to stay and his lightweight implementation provides a very good foundation for a lot of applications, such as a Microservices architecture. So, without further delay, let’s begin do dive in on Docker, one of the most popular container engines on the market today. Docker was developed by Docker inc (formerly DotCloud inc) as a open-source engine for deployment of applications on containers. By providing a logical layer that manages the lifecycle of the containers, we can focus our development on the applications themselves, leaving the implementation of the container management to Docker. On the image above we can see the Docker clients connecting to the daemon, making requests to start/stop/create containers etc. We can also see that the daemon is communicating with a image repository and using images while processing the requests. What are those images for? That’s what we will find out on the next section. When we talk about containers on Docker, we talk about processes running from instructions that were set on images. We can understand images as the building blocks from which containers are build, that way organizing the building of containers on a Docker environment. This images are distributed on repositories, also known as a docker registry, which in turn are versioned using git. The main repository for the distribution of Docker images is, of course, the Docker Hub, managed by Docker itself. If the reader is familiar with traditional virtualization with hypervisors, he could be thinking: “How Docker manages the file system so the images didn’t get ‘dirt’ from the files generated on the executions of all the created containers?”. This could be even worse when we think that images can be inherited from other images, making a whole image tree. The answer for this is how Docker utilizes the file system, with a file system called Union File System. On this system, each image is layered as a read-only layer. The layers are then overlapped on top of each other and finally on top of the chain a read-write layer is created, for the use of the container. This way, none of the image’s file systems are altered, making the images clean for use across multiple containers. Docker is designed for use on Linux distributions. However, for use as a development environment, Docker inc released a Docker Toolbox that allows it to run Docker both on OSX and Windows environments as well. In order to do this, the toolbox install virtualbox inside his distribution, as well as a micro linux VM, that only has the minimum kernel packages necessary for the launch of containers. This way, when we launch the terminal of the toolbox, the launcher starts the VM on virtualbox, starting Docker inside the VM. Another thing to notice is that, when we use docker on OSX or Windows, we don’t need to use sudo to execute the commands, while on Linux we will need to execute the commands as root. Another way to use Docker that removes the need to use sudo is by having a group called ‘docker’ on the machine, which will make docker apply the permissions necessary to run docker without sudo to the group. Notice, however, that users from this group will have root permissions, so caution is required. Well, now that we get the concepts out of the way, let’s start using Docker! 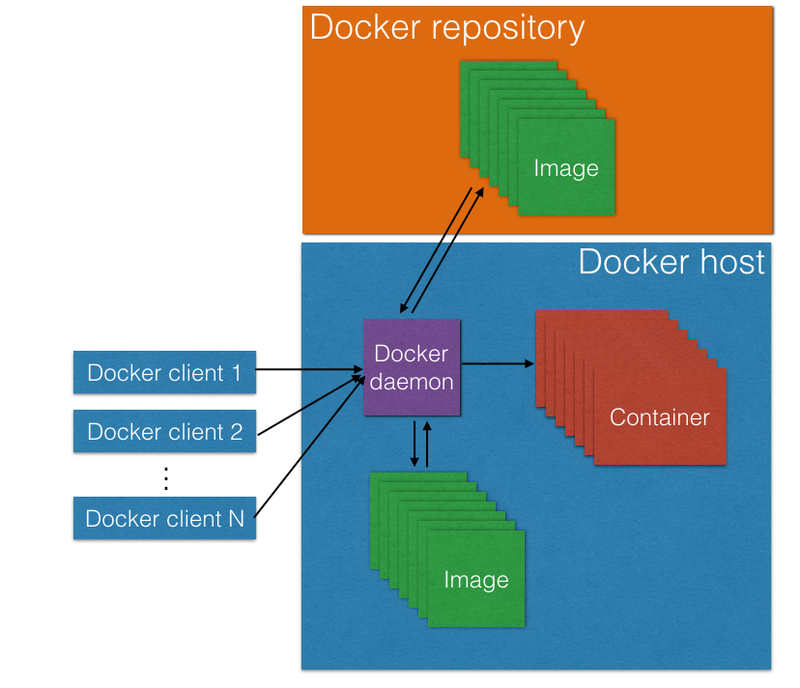 As said before, Docker uses image repositories to resolve the images it needs to run the containers. Let’s begin by running a simple container, to make a famous ‘hello world!’, Docker style. This is the run command, which creates a new container each time is called. On the command above, we simply asked Docker to create a new container, using the image ubuntu – if it doesn’t have already, Docker will search Docker Hub for the latest version of the image and download it. If we wanted to use a specific version, we could specify like this: ‘ubuntu:14.04’ – from Docker Hub. At the end, we specify a command for the container to run, on this case, a simple “echo ‘hello world!’ “. PS: The hash you can see on the command is part of the ID of the container, that you can see when you list the containers with docker ps. If we run docker ps -a again, after running the command above, we can see that there’s no containers from our previous execution, proving that the flag worked correctly. Once inside the Docker Hub, let’s search for the image typing ‘tomcat’ on the search box on the top right corner of the site. We will be send to a screen like the one bellow. You can see the images with some classifiers like ‘official’ and ‘automated’. Official means that the image is maintained by Docker itself, while automated means that the image is maintained by a CI workload.On the section ‘Publishing on Docker Hub’ we will understand more about the options to publish our own images to the Docker Hub. You can see that we used some new flags on this command. First, we used the flag –name, which makes a name for our container, so we can refer to this name when running commands afterwards. The -p flag is used to bind a port from the host machine to a port on the container. On the next sections, we will talk about creating our own images and we will see that we can expose ports from the container to be accessed by clients, like in this case that we exposed the port tomcat will serve on the container (8080) to the port 8888 of the host. The problem is that now our terminal is occupied by the tomcat process so we can’t issue more commands. Let’s press Crtl+C and type the docker ps command. The container is not active! the reason for this is that, by default, Docker don’t put the containers to run in background when we create a new container. To do this, we use the -d flag, so on the previous command, all we had to do is include this flag to make the container start on background. This command has the same effect of the tail command on a file, making it possible to watch the logs of the container. Take notice that after attaching to a container, pressing Ctrl+C will kill him! As we can see, the first instruction is called FROM. This instruction delimits the base image upon the image will be constructed. On this case, the java:7-jre image will create a basic Linux environment, with Java 7 configured. Then we see some ENV instructions. This commands set environment variables on the OS, as part of Tomcat’s configuration. We can also see a WORKDIR instruction, which defines the directory that, from that point, Docker will use to run the commands. We also see some RUN instructions. This instructions, as the name implies, run commands on the container.On the case of our image, this instructions make tomcat’s installation process. Finally we see the EXPOSE instruction, which exposes the 8080 port for the host. Finally, we see the CMD instruction, which defines the start of the server. One important distinction of the CMD command from the RUN ones is that, while the RUN instructions only executes on the build phase, the CMD instruction is executed on the container’s startup, making it the command to be executed on the creation and start of a container. For this reason, it is only allowed to have one CMD command per Dockerfile. One important side note about the CMD command is that, when starting a container, it allows to override the command on the Dockerfile, so it could lead to security holes when used. For this reason, it is recommended to use the ENTRYPOINT instruction instead, that like the CMD instruction, it defines the command the container will run at startup, but on this case, it will not permit the command to be overridden, making it more secure. We could also use ENTRYPOINT and CMD combined, making it possible to restrict the user to only pass flags and/or arguments to the running command. STOPSIGNAL: Defines the code for the container to stop, as a number or in the SIGNAME format, for instance SIGKILL. As we saw on the previous section, in order to create our own images, all we have to do is create a “Dockerfile” file, with the instructions necessary for the building. However, in order to distribute our images, we need to register them on a image registry, like the Docker Hub, for example. Where the second argument is the <repository ID>/<image name>. In order to push the images to Docker Hub, the repository ID must be equals to the username of our Docker Hub account. Another way of publishing is by linking our images with a git repository, this way the Docker Hub will rebuild the image each time a new version of the Dockerfile is pushed to the repository. Is this method of publishing that generates automated build images, since this way Docker can establish a CI Workload with the git repository. We will see this method in action on the next section, ‘Creating the base image’. On our lab, we will take a step forward from my previous post about microservices with Spring Boot (haven’t see it? you can find it here, I am really grateful if you read that post as well! ), by using a Service Registry called Eureka, designed by Netflix. Spring Cloud provides tools for developers to quickly build some of the common patterns in distributed systems (e.g. configuration management, service discovery, circuit breakers, intelligent routing, micro-proxy, control bus, one-time tokens, global locks, leadership election, distributed sessions, cluster state). Coordination of distributed systems leads to boiler plate patterns, and using Spring Cloud developers can quickly stand up services and applications that implement those patterns. They will work well in any distributed environment, including the developer’s own laptop, bare metal data centres, and managed platforms such as Cloud Foundry. Also, to “Springfy” even more our example, we will exchange our implementation from the previous post that uses pure jax-rs to the RestController implementation, present on the Spring Web project. Well, so let’s begin our practice! First, we will create a Docker Network to accommodate the containers. If we see the network adapters from the host machine when the Docker Daemon is up, we will see that he creates a bridge adapter on the host, subsequently appending the containers on network interfaces inside the bridge adapter. This forms a subnet where the containers can see each other and also Docker facilitates the work for us, by mapping the container’s IPs with their names, on the /etc/hosts files inside. On our scenario, we will use this feature so the microservices can easily find our Eureka registry, by mapping the address to the container’s name. Of course that on a real scenario we would have a cluster of Eurekas with a load balancer on separate hosts, but for simplicity’s sake of our lab, we will just use one Eureka instance. Notice that, for now, the containers object is empty. This is why we didn’t add any containers to the network yet, but this will soon change. Now we will create the Dockerfile. Create a folder in the directory of your choice and create a file called ‘Dockerfile’ (without any extension). On my case, I will push my Dockerfile to a Github repository, in order to create the image on Docker Hub as a automated build image. You can find the repositories with the source for this lab at the end of the post. As we can see, it is a simple Dockerfile. We use Java’s 8 official image as the base, define a volume and set his folder as our Workdir, expose the 8080 port which is the default for Spring Boot and finally we combine the entrypoint and cmd commands, meaning that anything we pass when we get up a container will be treated as parameters for the Java command. But what is this volume we have speaked of? The reader must remember what we saw about the Union File System and how each image is layered as a read-only layer. The volumes on Docker is a technique that bypasses the Union File System, by defining a mount point on the Containers that points for a shared space on the host machine. The uses of this technique are in order to provide a place where the container can read/write information that needs to be persisted, alongside the need to share data between containers. On our scenario, we will use the volume to point to a place where the jars of our microservices will be generated, so when a container runs a microservice, it runs the last version of the software. On a real-world scenario, this place could be a result of a CI workload, for example from a Jenkins job. 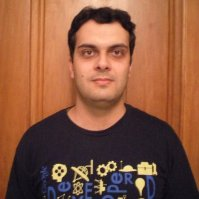 docker build -t alexandreesl/microservices-spring-boot-base . At the end, we will see a message that our building was successful, validating the Dockerfile. Out of curiosity, if you see the building process, you will notice that Docker created several temporary containers for each instruction of our script, maintaining a status of the last successful instruction executed, so if we have to rebuild the image after a failure, we can restart from the failed point. We can disable this feature with the flag -no-cache if we want. After clicking on the create button, we have completed our step, successfully registering our image on the Docker Hub! You can see my image on this link. After the download, we will have the image from the Docker Hub repository. For the service registry image, we actually don’t have to do any coding, since we will use a already made image. We will start the image on the “Launching the containers” section, but the reader can see the image’s page to satisfy his curiosity here. Now, Let’s prepare the services for the registering/deregistering of microservices, alongside service discovery when a service has dependencies. To focus on the explanation, I will omit some details like the pom configuration, since the reader can easily get the configuration on the Github repository from the lab. On this lab, we have 3 microservices: a Customer service, a Product service and a Order service. The Order service has dependencies on the other 2 services, in order to mount a Order. The key line here is the annotation @EnableEurekaClient, which configures the Spring Boot’s application to work with Eureka. Just with these annotation alone, we configure Spring Boot to connect to Eureka at startup and register itself with, send heartbeats during his lifecycle to keep the registration alive and finally make a unregistration when the process is terminated. Also, it instantiate a RestTemplate with a Ribbon load balancer, also made by Netflix, that can easily lookup service addresses from the registry. All of this with just one annotation! In order to connect to Eureka, we have to provide the registry’s address. this is made by configuring a YAML file, called application.yml, that we put it on the resources source folder. We also configure a application name on this file, in order to inform Eureka about what Application’s ID we would like to use for the microservice. Notice that when we configure Eureka’s address, we used “eureka” as the host name. This is the name of the container that we will use in order to deploy the Eureka server on our Docker Network, so on the /etc/hosts files of our containers, this name will be mapped to Eureka’s container IP, making it possible to point it out dynamically. logger.warn("The order " + id + " for the client " + customer.getBody().getName() + " with the product "
The first thing we notice is the autowired RestTemplate, that also has a@LoadBalanced annotation. This RestTemplate is automatically instantiated by Spring Cloud, creating a interface which we could use to communicate with Eureka. The annotation informs that we want to use Ribbon to make the load balance, in case we have a cluster of instances of the same service. The exchange method we use inside of the submitOrder method is where the magic happens. When we make our calls using this method, internally a lookup is made with the Eureka Server, the addresses of the service are passed to Ribbon in order to load balance the calls, and them the call is made. Notice that we used names like “CUSTOMERSERVICE” as the host address on our URIs. This pattern tells the framework the ID of the application we really want to call, been replaced at runtime with one of the IP addresses of the service we want to call. And that concludes our quick explanation of the Java code involved on our lab. Again, if the reader want to get the full code, just head for the Github repositories at the end of this post. In order to run the lab, I recommend that you clone the whole repository and execute a mvn package command on each of the 3 projects. If you don’t have Maven, you can get it from here. Excellent! Not only has Eureka booted up successfully, but also all of our services have registered with it. Let’s now toy a little with our stack, to test it out. And that concludes our lab. As we can see, we builded a robust stack to deploy our microservices with their dependencies, with little effort. In all of our examples, we are always working with a single Docker host, our own machine on the case. On a real production environment, we can have some dozens or even hundreds of Docker hosts. In order to make all the hosts to work together, it is necessary to implement some layer that manages the hosts, making them appear as a single cluster to the consumers. This is the goal of Docker Swarm. With Docker Swarm, we can connect multiple Docker hosts across a network, using them as a single cluster by using Docker Swarm’s interface. For further information about Docker Swarm alongside a good example of utilization, I suggest consulting the excellent “The Docker Book”, which I describe on the next section. And this concludes our tour on the world of Docker. With a simple interface, Docker allows us to use all the power of the container world, allowing us to quickly deploy and escalate our applications. Never it was so simple to deploy our applications! Thank you for following me on another post, until next time.